2draw.net - boards - Intermediate - wee! planes! it's all like. loose. and tight. and loose. whatever. I like it. no composition ref. googled for wwii planes to get some general ideas. It so does not suxxOrs, whatever the hell that means. It looks just like a game my husband plays on here sometimes. It makes me want to shoot something. THis scene reminds me of that huge dogfight recreated in "The Aviator". I like how the shells and shrapnel are sort of fuzzy like they are moving faster then the camera and the planes. Cool battle Marcello. Awesome pic! 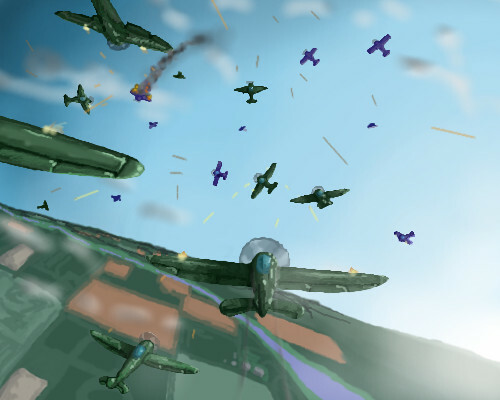 The flow of battle seems to be in the green squadron's favour, as it appears the planes in the forground are just getting stuck in the fight. This reminds me a lot of that old online flight sim, Fighter Ace. Man, I loved that game... I'd probably be the guy that's just burst into flames though. heh. It just seems like something is missing. Way to go OhCreator.. I love pics like this.. you captured the feel very nicely. To steal Staci's comment because she is so quietish, excellent composition! It really feels "off kilter." The shots kind of look like pick-up-sticks though. edit: wahaha! Good eye, Zer. The green plane is obviously a blue plane in disguise.